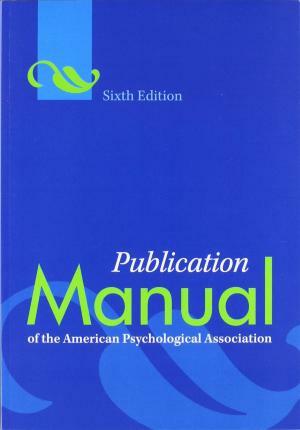 The Publication Manual of the American Psychological Association is the style manual of choice for writers, editors, students, and educators in the social and behavioural sciences. It provides invaluable guidance on all aspects of the writing process, from the ethics of authorship to the word choice that best reduces bias in language. Well-known for its authoritative and easy-to-use reference and citation system, the Publication Manual also offers guidance on choosing the headings, tables, figures and tone that will result in strong, simple, and elegant scientific communication. The Sixth Edition offers new and expanded instruction on publication ethics, statistics, journal article reporting standards, electronic reference formats, and the construction of tables and figures. expanded discussion of the publication process, including the function and process of peer review; a discussion of ethical, legal, and policy requirements in publication; and guidelines on working with the publisher while the article is in press. Redesigned APA Style website, expanded to provide tutorials, on-line courses, and other resources for learning APA style. Organised to describe the writing process from idea to publication, it begins with background information on ethical issues in publishing, then moves on to manuscript structure and content, then writing style and rules, then graphics and references, then guidance on working with the publisher. Focus has been broadened to include readers in the behavioural and social sciences.